Meeting in Hillsborough, North Carolina, delegates convened from July 21 to August 4,1788 to consider ratification of the newly proposed federal Constitution. Key state Federalists were James Iredell Sr., William Davie, and William Blount. 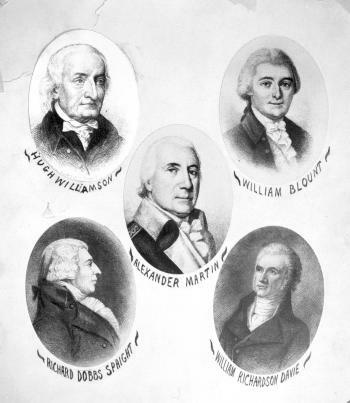 Antifederalist leaders included Willie Jones, Samuel Spencer, and Timothy Bloodworth. Governor Samuel Johnston presided over the Convention. The two-week long deliberations resulted in neither ratification nor rejection. The 1789 Fayetteville Convention continued the debate. Led by James Iredell, Sr., the Federalists wanted a stronger national government vested with powers absent from the Articles of Confederation. The events of Shays’ Rebellion led many Federalists to conclude that a more central government was imperative to the country’s survival. Likewise, many Antifederalists believed that a smaller, more restricted government would preserve liberty. Though they understood the potential utility of a stronger government, most Antifederalists desired a limited government that had little authority over the (especially financial) affairs of its people. The Antifederalists, led by Willie Jones and Samuel Spencer, desired also an explicit list of freedoms and liberties. They were particularly wary of a government that had the ability to encroach on individual liberty and states’ rights. At the convention, debate continued for two weeks, but Federalists failed to assuage Antifederalists’ fears that the Constitution would one day concentrate power at the national level and enable the government to chip away at states’ rights and individual liberty. The possibility of abuse of the powers of levying taxes, appointing government officials, and instituting a strong court system was of particular concern to the Antifederalist majority. The absence of a bill of rights guaranteeing personal liberties to the people further blocked support for the Constitution. The Antifederalist majority concurred with delegate William Gowdy of Guilford County, when he remarked: “Power belongs originally to the people, but if rulers be not well guarded, that power may be usurped from them.” Without a bill of rights protecting such liberties, the U.S. Constitution would not be ratified – at least in North Carolina. With the hope of effecting the incorporation of a bill of rights into the U.S. Constitution, the delegates voted 184 to 84 neither to ratify nor to reject the Constitution, and North Carolina remained out of the Union until the Fayetteville Convention. William Powell, North Carolina Through Four Centuries (Chapel Hill, 1989); Stephen E. Massengill, ed., North Carolina Votes on the Constitution (Raleigh, 1988); Proceedings and Debates of the Convention of North Carolina (Edenton, 1789).